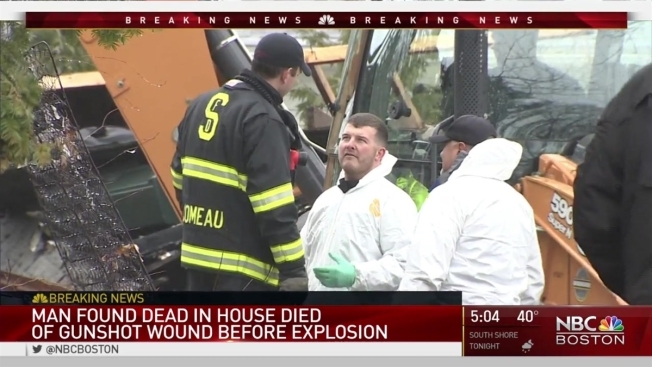 A body found inside a Salem, New Hampshire, home following an explosion and massive fire on Monday has been identified as the homeowner. Salem police said the body has been identified as 55-year-old Charles Hill. He was found in the basement with a self-inflicted gunshot wound to the head. He was found with an unknown type 7.62 mm long rifle, a 9mm handgun, a .45 caliber handgun, two knives and 136 rounds of ammunition for the three firearms nearby. Additionally, over 1,700 rounds of ammunition and four exploded magazines were found elsewhere in the home. Firefighters soon arrived at the scene to douse the flames, which could be seen shooting from the home. Nearby homes were temporarily evacuated. Police said it appeared that Hill had planned the incident, possibly even preparing for police or fire to get close to the residence. They said it did not appear to have been an accident. No first responders were injured in Monday's incident, and the cause of the fire remains under investigation. Some consumer grade fireworks were found in the rubble. When they did enter, police found Hill's body in the basement, along with the weapons and ammunition. But he was not officially identified until Wednesday morning. According to court documents, the town filed suit against Hill last summer, saying he was in violation of local zoning ordinances and housing standards because of accumulating trash and debris on his property and that the home was "unfit for human habitation." The home was demolished on Tuesday.